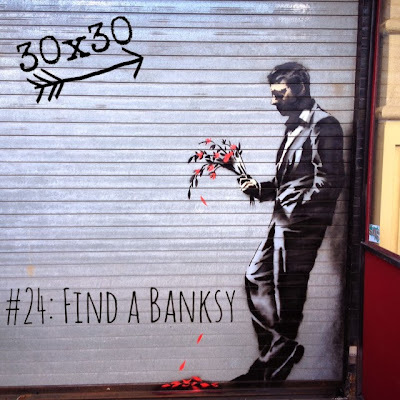 Prolific graffiti artist Banksy recently declared a month-long "residency" on the streets of New York. I've long been a fan of Banksy and urban street art in general (yes, it's illegal, but so are a lot of things that are no where near as beautiful or interesting to look at), so viewing a Banksy, live and in person, immediately got added to my list of 30 things to do before I turn 30. This became especially challenging because at the exact moment these artworks started hitting the streets, I descended into the dark underbelly of New York's theater world, resurfacing with just one week left in October. Add to that the facts that many of the artworks are in hard-for-me-to-get-to locations (I couldn't find Bushwick if you paid me) and have already been re-graffitied over, and it becomes clear why finding these limited editions was so difficult for me. But yesterday, I happened upon the perfect combination: an afternoon off AND an actual address of the most recent Banksy - the side door of the Hustler Club on Manhattan's west side. With a spring in my step and a fully charged iPhone, off I went. Admittedly, this one wasn't hard to spot. Half a block away there were people selling Banksy magnets from inside a garage. 2 bouncers and a group of about 20 people surrounded the artwork, and I had to wait for my turn to reach my arms through a gap in the crowd to snap the requisite photos. But lack of ceremony aside, there it was in all it's glory - a forlorn man leaning up against a doorway, waiting for his paramour while the flowers from his bouquet wilted to the ground. And I have to say that it was beautiful. It was bright and vivid and elicited emotions I didn't think possible from a mere few cans of spray paint. I was pretty pleased with myself - I found a Banksy! But my luck didn't stop there. A few hours later and on my way to work, I saw a huge group of people gathered in Union Square. Since it is not out of the ordinary for large amounts of people to be staring at something in a heavily trafficked area in New York, I actually didn't pay too much attention to whatever they were staring at. Until I heard squawking. And mooing. And banging. And then I looked up, and found myself face-to-face with a second Banksy - called the Sirens of the Lambs, this one is a mobile art installation in which a slaughterhouse delivery truck filled with animatronic stuffed barnyard animals roams the streets of New York. It was disturbing. And recollective of The Jungle. And turned me into a vegetarian for a solid 20 minutes. The poor little lambs actually looked down at you, begging to be saved from the deep fryer! Rethinking my culinary outlook on life, I began to walk away when I pretty much ran right into a THIRD Banksy - a replica of a Ronald McDonald statue with a live actor in tattered clothing giving the clown's shoes a shine. This was easily the most thought-provoking artwork of the three. The social commentary was obvious, but it also brought to mind the degree to which someone will go to make a point. Artists have been creating performance art in the form of live installations for decades (Marina Abramović, Wafaa Bilal, Sophie Calle, just to name a few), but these are often ticketed events and/or situations in which the patron has to seek out or attend the artwork, and usually feature the artist him/herself. In the case of this Banksy, however, unsuspecting viewers happen upon this artwork in the middle of their commute. This then begs the question, does one need to seek out art in order for it to be effective? Or is it actually more effective if it surprises you? I went looking for Banksy - but I can only imagine how someone would feel if s/he had run to McDonald's on a lunch break only to be confronted with a poor-looking teenager literally toiling at the feet of the very symbol of the business he was attempting to patronize. Definitely food for thought, and certainly the most interesting and exciting of my 30x30 projects so far. Banksy is supposed to be in this city for another week or so, and I hope to see more of his work, whether intentionally or by accident.